Perfect for a summer barbeque. I suggest preparing a Greek salad and rice to enjoy a complete meal. Generously sprinkle salt and pepper on both sides of lamb chops. Set aside. Whisk garlic, mint, oregano, lemon juice, and olive oil in a small bowl. Pour mixture in a large glass baking dish. Add the lamb chops to the baking dish and generously coat lamb chops on both sides with the marinade. Allow flavors to absorb, about 15 minutes. 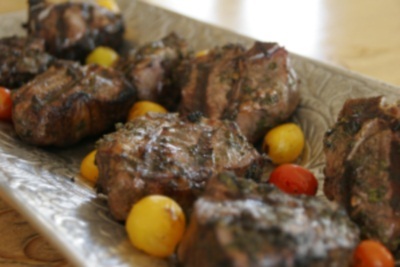 Prepare barbeque on medium- high heat and grill lamb chops to desired doneness, about 6- 7 minutes per side for medium. Serve with grilled cherry tomatoes and yogurt sauce. *Lamb chops may be marinated one day ahead.